The best just got better. Hammerhead paddles, exclusive only to M Series Degelman spreaders, will again change your thinking of spread distance and uniformity. Hammerhead paddles are state-of-the-art especially for wet, sticky and clay-mix manures. The hammerhead shape covers the discharge opening equalizing the load amongst the paddles and its weighted corrugated teeth shred and distribute material without a centre buildup. Spread pattern is truly unrivalled. The paddle cores start with a ½" heavy wall mechanical ten inch tube. Impeller paddles are simple and straightforward, produced from 1" Abrasion Resistant 400 material - about eight times more durable than regular mild steel. The paddles are interchangeable, reversible and can be easily replaced by removing a single over sized 1-3/4" stress proof pin - without cutting or welding. From the ground up, M Series were designed with superior components, easy access and minimal maintenance: replaceable impeller paddles, 4"x 12" HSST frame, super-duty gearboxes, oversized marine-grade chains, 1" AR400 paddles, self lubricating bearings, large oversized idler door access, external idler/drive grease points, high tensile bushings, nylon sandwiched walking wheels and easy to replace 2" x 4" floor slats. The speed of the floor drive is controlled via a 12v potentiometer that controls the flow of oil to the floor drive gearbox. The operator can then easily and conveniently control the output speed from the tractor cab. The Degelman M Series dosage gate is hydraulically operated to control the flow of material. The inside frame or window is designed to be smooth and clear of potential obstructions for maximum output. 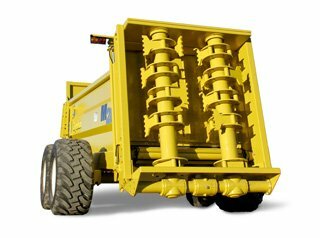 The entire drive and beater assembly can be quickly lifted off the machine in minutes to clear any severe blockages and will quickly convert your spreader into a versatile wagon with an active drive floor ideal for transporting other commodities such as dirt and silage.